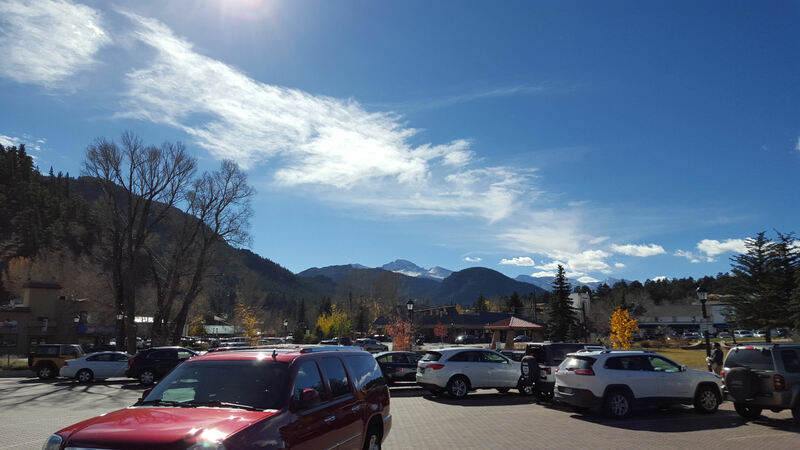 The Springs in Fall — 2015 Photos #2: Sunday in Estes Park « Midlife Crisis Crossover! I sure hope y’all like mountains because we took roughly six million photos of the Rockies on this trip. On Sunday we landed in Denver shortly after 9:30 their time. 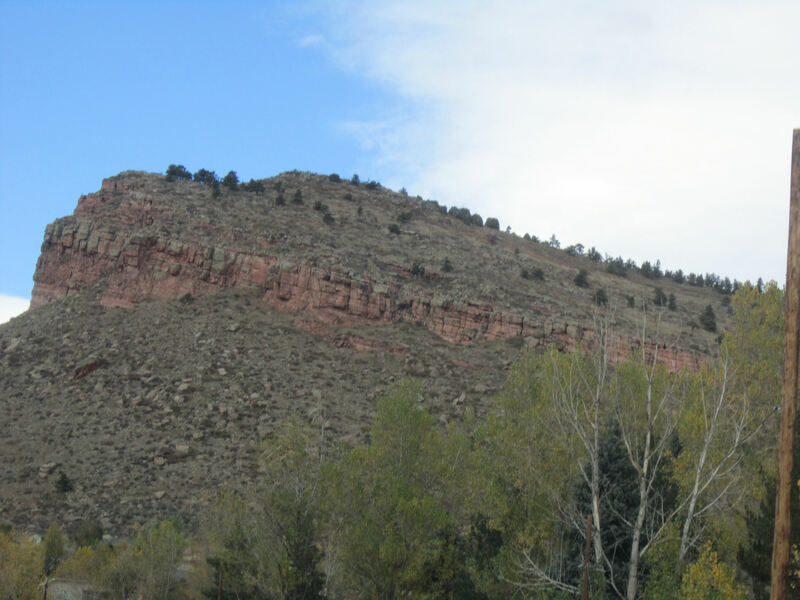 Our Colorado Springs hotel was seventy minutes south of the airport. 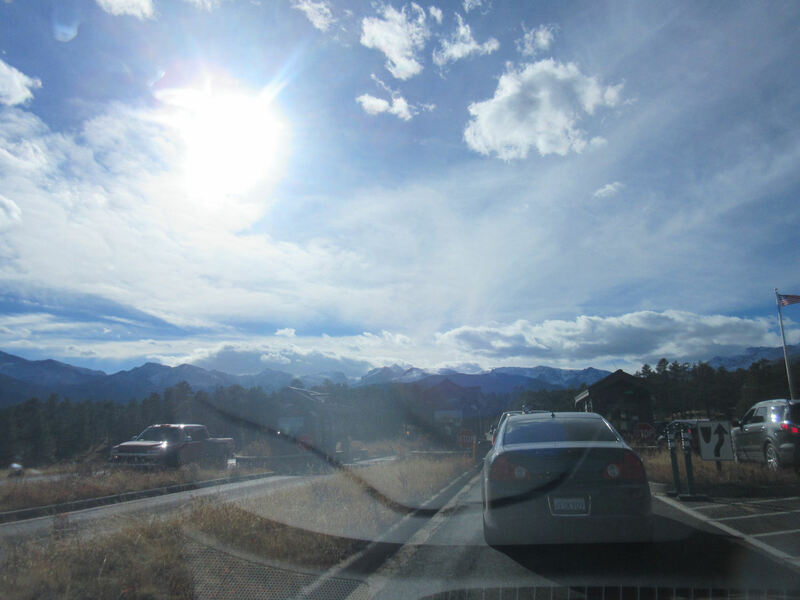 We couldn’t check in till 3 p.m. With plenty of time on our hands, we decided to follow up our short flight with a long drive — two hours northwest of the airport for an encore in a little town we last visited in 2012 called Estes Park, snug inside the Rocky Mountains. For those who weren’t here in 2012, our previous misty mountain hop was chronicled over here and over there. Hopefully some of this year’s pics look slightly different. Anne was so excited, she couldn’t wait to arrive and park, and took this while we were still on the road, maxing out her zoom lens for all it was worth. We also found it hard to wrap our heads around the idea that we woke up in Indianapolis that morning and had more or less been teleported to absolutely different Colorado in no time at all. Such was the weirdness of recovering from our very first flight, that the effect was like a Star Trek transporter to us. Much WOW-ing ensued. It’s a nice feeling and we appreciate that no one called us bumpkins to our faces. We parked in the town’s heavily commercial area and wandered for a few through parking lots and fields of hibernating grass. Some areas still bore the traditional autumn colors, but many had gone post-harvest brown by now. 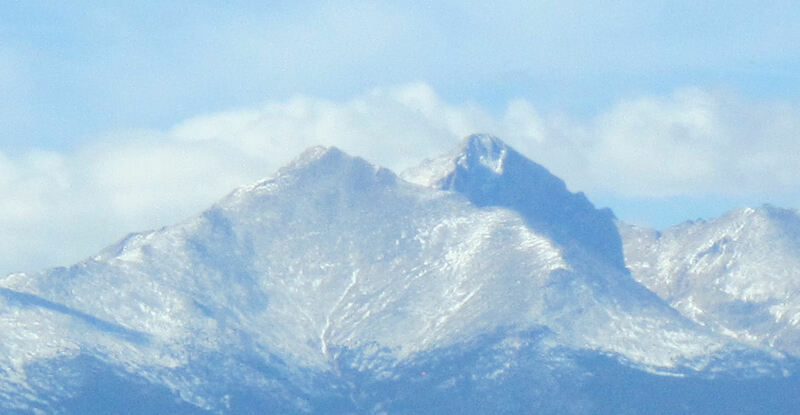 Fun trivia: we’d seen mountains in person before, but never snow-capped ones till now. 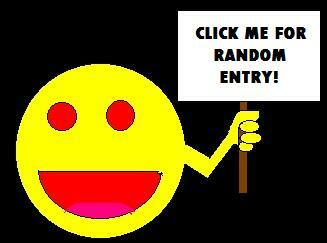 Strange but true. 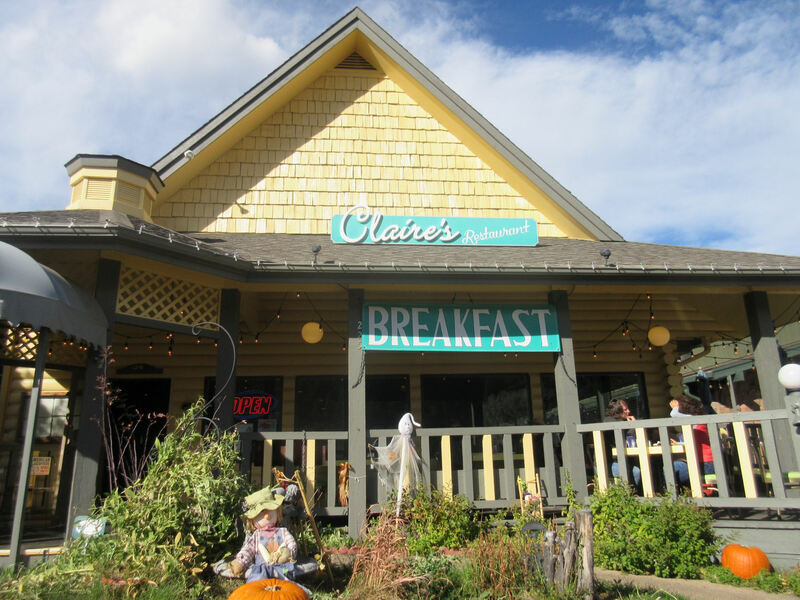 Lunch was at a downtown spot called Claire’s on the Park. We assumed every place in town would have a long line, but we were seated immediately. Perhaps we looked sufficiently dizzy and fraught with tourist hysteria or something. There seemed to be some disagreement between the hostess and the waitress as to whose job it was to provide silverware and first-round napkins to us, but the staff was otherwise pleasant. Remember, this was November 1st. 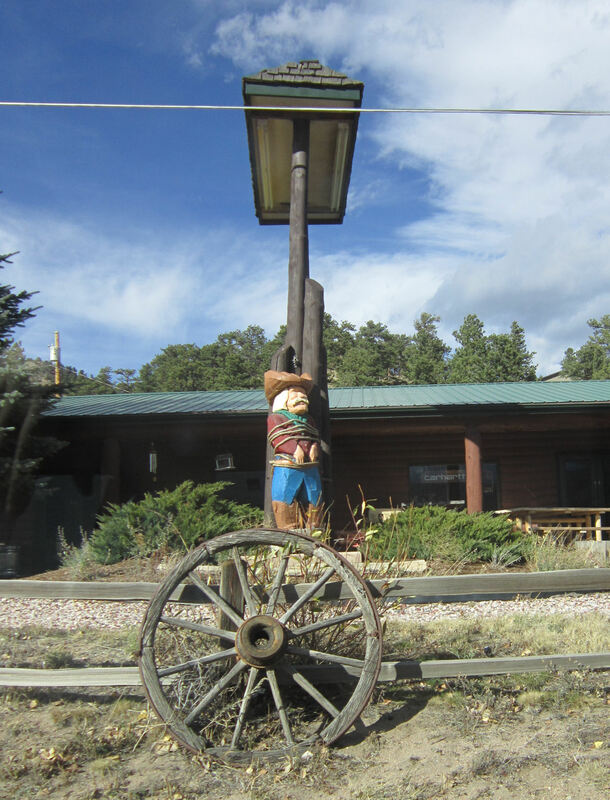 We saw Halloween decorations lingering around several places throughout the week. So cute! Our airport breakfast hadn’t been too large, nor were our in-flight snacks. Anne ordered herself a hearty yet simple repast that I would call a “Ron Swanson burger”, and treated us both to a plate of spring rolls. Since they serve breakfast during all open hours, I opted for second breakfast and tried their Cuban Benedict, one of seven Benedictine options on their menu. 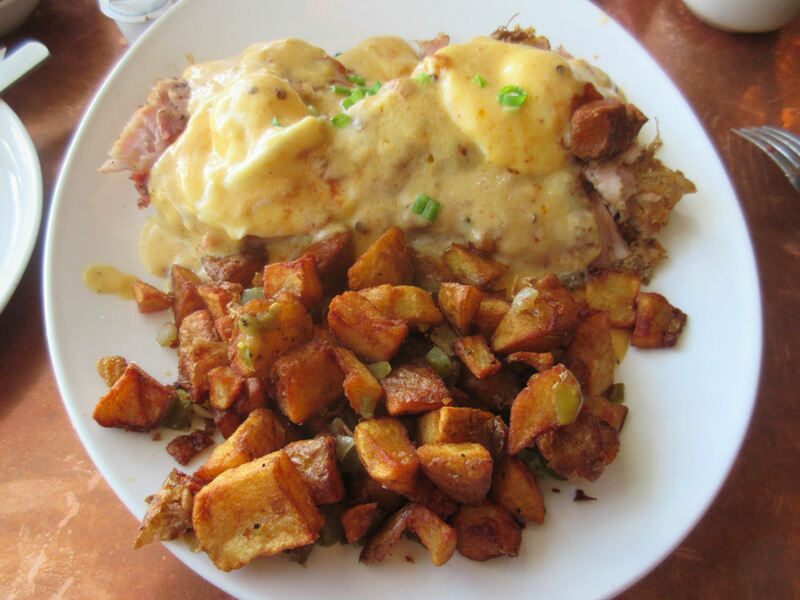 Pulled pork, poached eggs, chipotle hollandaise, and chives on chorizo biscuits. Plus potatoes, natch. 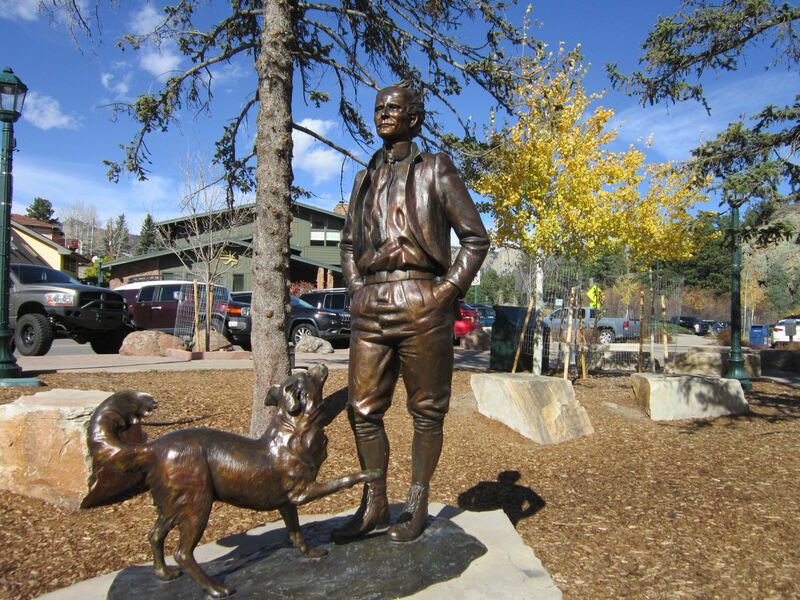 In front of Claire’s is a small park featuring a statue of Enos Mills, credited as “The Father of Rocky Mountain National Park”. I think that means he was the first guy to say, “We should throw a gate in front of God’s majesty and draw some colorful maps!” not that he built the mountains himself from scratch. Eventually we saw wild animals on the go. 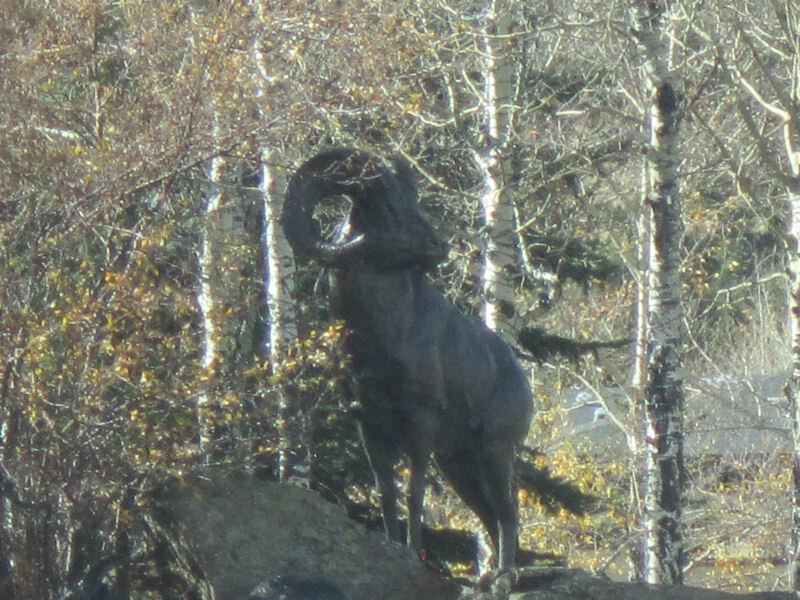 For our first hour in town, this ram statue was the closest thing we got. Someone else’s leftover Halloween diorama. We think. Non-snowy, non-park mountains along the way. We’d seen plenty of green and brown mountains before. This time we demanded better. 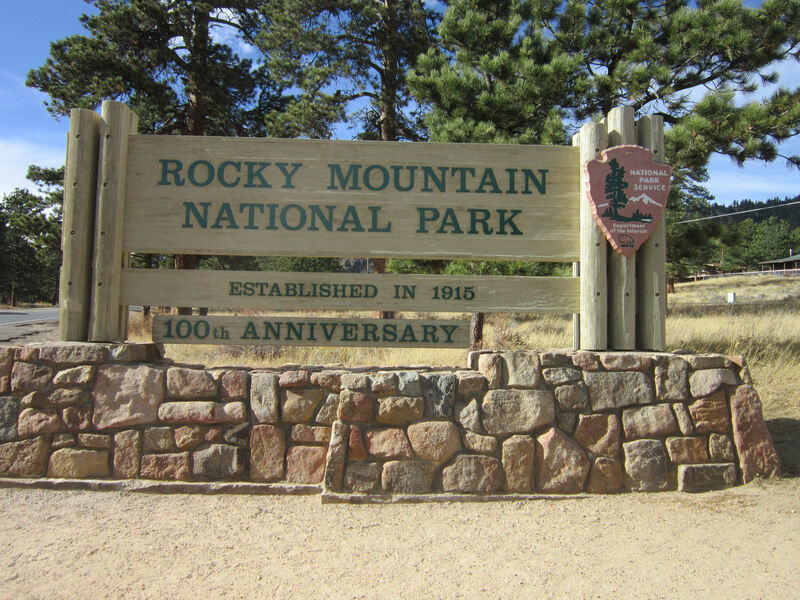 …until we arrived at Rocky Mountain National Park, our former onetime stomping ground for a day. Basically the greatest national park we’ve seen so far. If we ever find the means to travel west of the Rockies, perhaps someday that title will be challenged. Hasn’t happened yet. You Are HERE. Everywhere else you’ve ever been is now irrelevant. 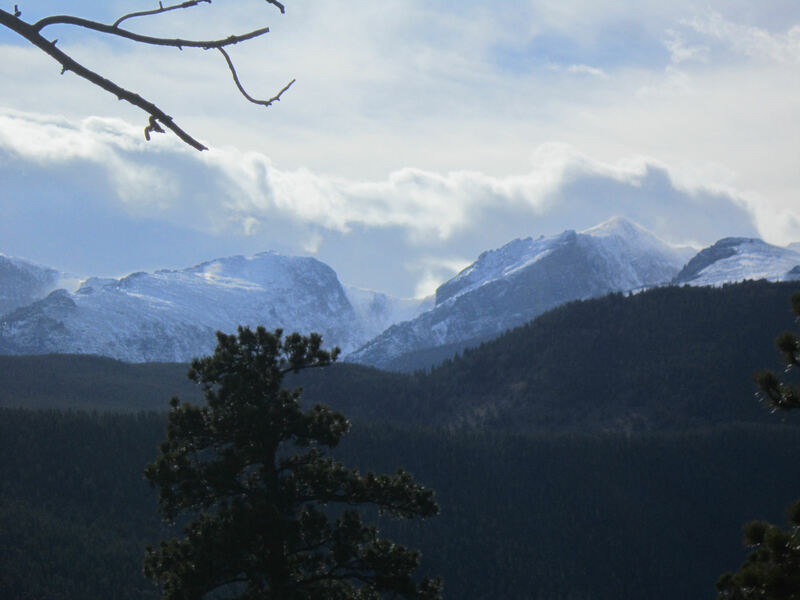 This was the first among Anne’s half of our RMNP shots. I don’t even know how to whittle down the remaining eleventy thousand to just a few entries, rather than going all-mountains all the time for the next month and renaming the site Mountaintop Compulsory Closeups. Tip of the iceberg, so to speak. To be continued! Next time: MOUNTAINS. MORE. BIGGER. BETTER. MAYBE NOT FASTER. But definitely more. Breathtaking! The second photo looks like a painting. More mountains!! More more! Consider it done! Um, eventually. Trying to balance two different series, plus other random posts, plus non-writing real-world obligations, would work out a lot better if I could get away with sleeping only five minutes a day. But there will be more mountains, guaranteed!